Has your child ever seen the dentist? Do you have any queries about your child’s teeth or want your child to be seen by the dentist even if they have a dentist? We provide FREE dental care for all children that attend the Hackney Ark and can complete treatment on the mobile dental van parked on site. If you would like your child to be seen by our friendly team at the Hackney Ark please contact us on the number below to arrange an appointment for your child. 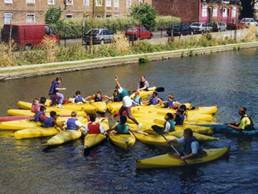 Laburnum Boat Club is a community-based boating project by the Regents Canal in Haggerston. It is essentially a water-based youth club, providing a range of activities for Hackney children and young people throughout the year – with a particular emphasis on kids with disabilities. For 16-24 year olds NOT in full time employment, who want to become watersports instructors…….£FREE! Monday sports club: 4.30 – 7pm for 14-19 year olds. Thursday sports club, 4.30 – 7pm for 9-13 year olds. Activities this year include swimming, football, basketball and power boating. Please call the club for more details.in Haggerston. It is essentially a water-based youth club, providing a range of activities for Hackney children and young people throughout the year – with a particular emphasis on kids with disabilities. Time: Junior Club: (for under 16s + family & carers) 12pm to 1pm. Adults Club: 1pm to 3pm. Also: FREE 1 to 1 all ability sessions- 1 hour with an instructor.